Death is a popular theme in Irish Music. Emblematic of this is the Irish Wake, an often rowdy gathering of mourners around the body of the departed, traditionally held in a family member’s home. 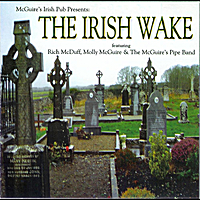 McGuire’s Irish Pub and Rich McDuff have drawn upon this theme in the production of The Irish Wake, CD of popular Irish tunes. Proclaimed as “music for and about an Irish Wake that includes solemn to lighthearted and humorous tunes,” the Irish Wake delivers upon its promise. These are high-quality musical arrangements making use of traditional Irish instruments, and with a few tunes characterized by layers of vocal harmonies. This is most noticeably heard on “Amazing Grace,” sung by Molly McGuire, making for a creatively unique and interesting rendition of the song. Some of the other highlights include “Rosin the Beau,” and “Isn’t it Grand Boys” (featuring the Boston Boys, a group of young McGuire’s patrons), and the title track – a Rich McDuff original. This is a somber disk containing 14 tracks, each one another variation on the theme of death, and in some cases resurrection. Packaged in the standard CD jewel case, the cover photo is quite fitting for the music on this disk; an old Irish cemetery marked by generations-old Celtic crosses enduring the turn of the centuries, reaching grimly toward a grey sky. Produced by Rich McDuff, and featuring Molly McGuire, the McGuire’s Pipe Band, and many local singers and musicians who frequent the pub, The Irish Wake is a great choice for fans of Irish music looking for a mellower listening experience. Entitled to compliment the Irish Wake, a green, rum-based drink popularized by McGuire’s Irish Pub, this CD is a clever bit of marketing as well as a pleasant journey through Irish music. A patron can enjoy an Irish Wake at the bar or in the restaurant, and before exiting the pub, stop in the gift shop and pick up a copy of this disk to remember his experience at McGuire’s. It can also be ordered at the link below. The Irish have produced some of the best drinking songs ever written. Characterized by their catchy melodies, comical lyrics, and their tendency toward tragic endings; a good night of pub-singing is a communal activity with much crowd interaction and participation. The following is a list of my top nine Irish Drinking Songs, in no particular order. Why nine? If you must ask, perhaps you need to learn more about the Irish. This is a straight forward song in praise of the fictionalized inventor of beer, Charlie Mopps. The name is meant to rhyme with barley and hops. The lyrics mostly describe how beer is made, where it is sold and how much better life is now that it has been invented. As far as creativity is concerned, lyrically this song is not the best. But it’s a great sing along tune the best thing about this song is its catchiness for group singing. A bit of a counterpart to “Whisky in the Jar,” this song is about the hazards of drinking heavy spirits. “Whiskey You’re the Devil” contains one of the wittiest verses in Irish drinking music; “Said the mother ‘Do not wrong me. Don’t take me daughter from me. For if you do I will torment you and after death, me ghost will haunt you.’” The chorus of this tune is the kind that just urges one to sing along. Tim Finnegan was a construction worker who had a bit of a drinking problem. He had a drink every morning before going to work. One day he had a bit too much and fell off a ladder and broke his skull. After everyone arrived at his wake, Finnegan’s widow served lunch followed by whisky punch. In short order some one said the wrong thing to another and a fight breaks out. Bottles of whisky are hurled through the air until the liquor platters over Tim’s corps. The whiskey magically revives him. Tim Finnegan stands up from the bed cursing the waste of good liquor and asking if they really thought he was dead. Grog is a combination of liquors popular especially amongst sailors in the 18th and 19th centuries. Essentially it was a mixture of whatever was left over. The lyrics of this song tell us of what appears to be a pirate coming ashore with his plunder. He spends all his money on wild nights with gin drinking women. The poor fellow parties his way through several days until he is “sick in the head” and “full of pains and aches.” He eventually sells everything from his boots to his shirt for money to buy beer and tobacco and decides to head back out to sea in order to get away from all the trouble he has caused for himself in port. One of the catchiest tunes in the Irish Drinking repertoire; Dicey Riley is about one hard drinking woman. She starts each day with a few drinks and continues on throughout the rest of the day. Each night she closes down the pubs, trashed and if she doesn’t have a friend to see her safely home she’ll sleep off her drink on a local park bench, only to do it all again the next day. Perhaps one of the most over played Irish drinking tunes, this one is a standard that has even been performed by the heavy metal band Metallica. The song is really about a robbery. The singer tells how he encounters one Captain Farrell in the mountains and demands his money at the point of pistol and rapier. He is eventually betrayed by his beloved Jenny, arrested and taken away by the very same Captain Farrell. Actually a song written for the Temperance Movement, it is ironic that this song has been so lovingly embraced as a drinking tune. Simply put, the song is about a roving man who has decided to repent of his rambling and drinking ways. 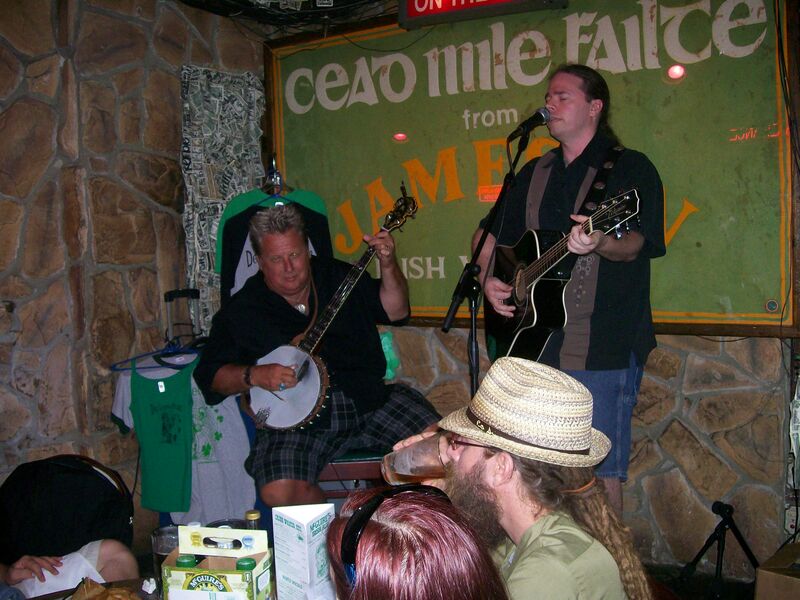 Along with “Whiskey in the Jar,” “The Wild Rover” is one of the most well known Irish drinking songs, so when it is played it is sure to get some crowd interaction. 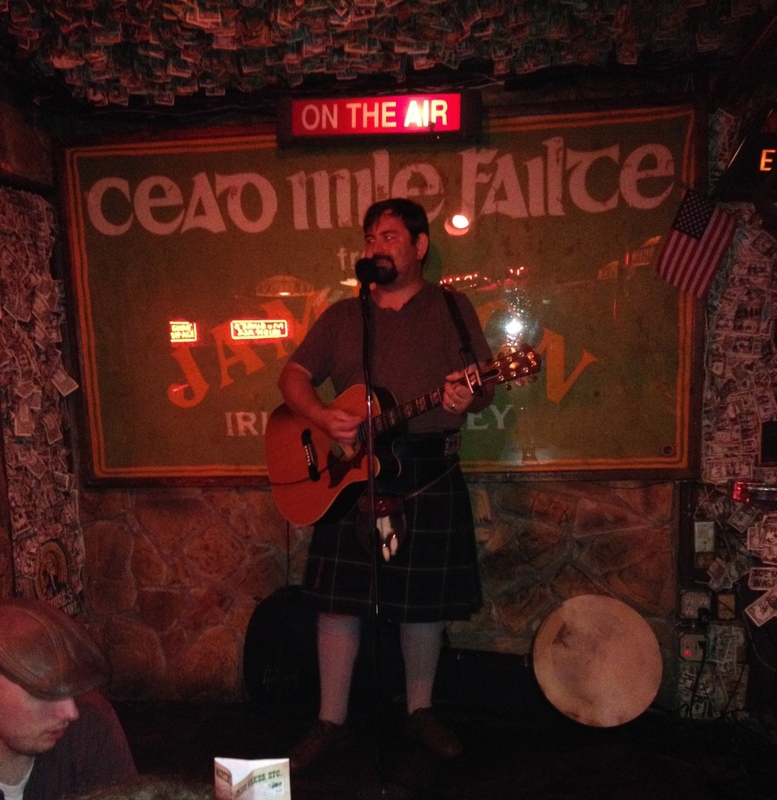 I was covered in Celtic-Folk-Punk at blogspot recently. Lojah is a Native American-Irish folksinger from Pensacola, Florida. He describes his eclectic sound as Creolized Roots Music, influenced by Caribbean rhythms, Celtic melodies, and Southern American blues. His music is immersed in social realism, and arcane insight woven together with tongue-in-cheek witticism and a festive vibe. He is currently performing acoustic sets along the Gulf Coast. “Pub Songs on Palafox” is a four song, lo-fi, EP recorded in the raw as a live-air production that captures the energy and sound of a Lojah solo performance as executed while busking downtown in competition with the various sounds of a bustling city street. Lojah begins with a rowdy Irish pub tune, “Dicey Reilly“, about a lush of a woman who spends her life crawling from pub to pub; a sailor’s favorite. “The Black Velvet Band” is another classic Irish ballad about infatuation, deceit and injustice which takes us out of the pub and away from the Emerald Isle to a penal colony in Australia. 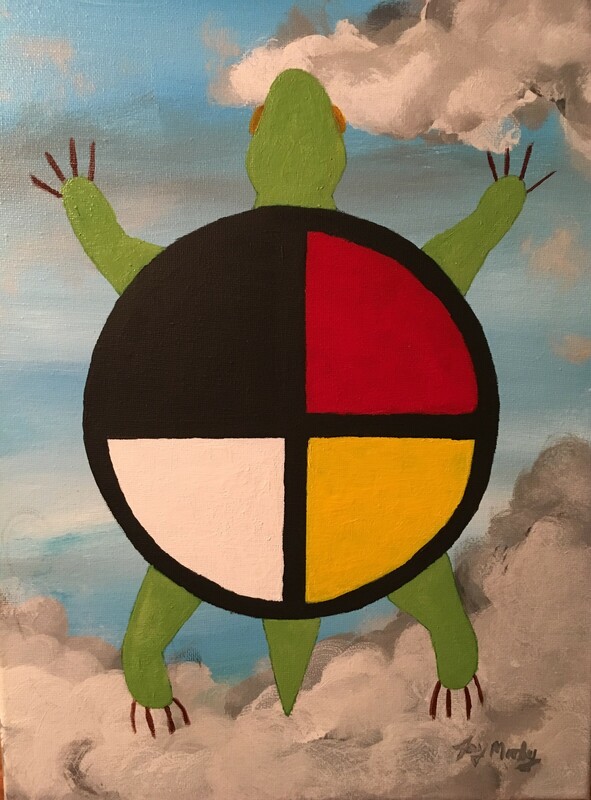 Following up is “Looks Like Jesus“, a rockabilly-blues styled piece and a Lojah original that tells the story illustrating the conflict between despair and ambition, shroud with esoteric imagery, set in the Southern atmosphere he calls home. “Miss Constance” concludes the record, a naughty Caribbean-styled tune about the perils of younger women. JJ’s style stands out from the majority of the singers I’ve met on the Irish pub tour in several ways. To begin with, his personalized renditions of the classics reveal significant blues, and American country music influences, which bring the Celtic style home to the American South. Live, JJ makes use of a lot of bass runs on his guitar which often helps to add a subtlety and a sense of motion outside of the songs’ basic chord structures. JJ hails from Stonehaven, near Aberdeen, Scotland, but has resided in St. Petersburg, Florida for the past several years. While in the States, he has steadily toured the southeast and managed to produce two album releases: Druid Roots Going Home, and his solo album JJ The Balladeer. They’re both great and very distinct from each other. Druid Roots was a trio JJ was a part of, a rather eclectic mix of folksy styles. 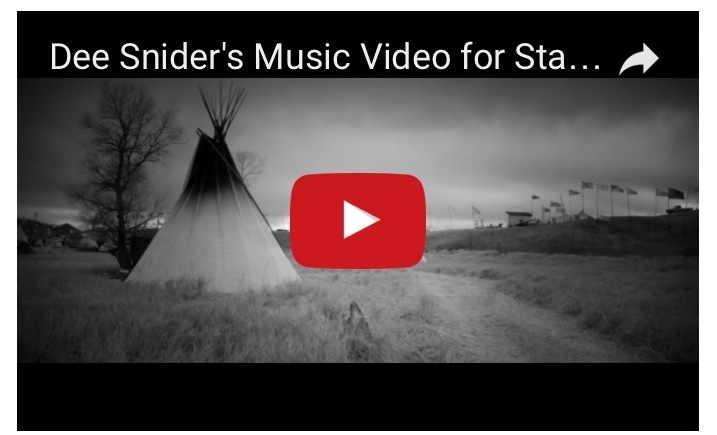 The album projects a heavy Celtic theme with very noticeable elements of East-Indian drumming, country-western music, and a hint of rock and roll. My favorite track is Stonehaven Waltz, a traditional sounding Celtic ballad, but the whole album is worth the listen. The Balladeer contains 15 tracks of excellently produced Celtic ballads. JJ’s resounding baritone voice coupled with the full and sometimes booming open strings of his guitar create layers of richness within each song. The songs are mostly mellow, somewhat nostalgic pieces. The highlights include Galway Shawl (my personal favorite); a cover of the classic U2 hit I Still Haven’t Found what I’m looking For; and Whiskey on a Sunday. Larry Kernagis is distinguished as the Chief Leprechaun of the Nashville based Celtic band cleverly named Def Leprechaun. With a full repertoire of classic Irish folk and drinking songs, Larry also tours as a solo act. I was fortunate enough to meet Larry at McGuire’s Irish Pub in Pensacola, Florida during this summer. As a skilled performer, Larry’s rich personality shines through his stage show. He’s friendly and personable, and interacts with the crowd brilliantly, accepting requests or limericks from the audience, bringing them into the show rather than keeping them as simple observers. I’ve even been fortunate enough to sit in with him on a couple different occasions. Since many newcomers to the Irish music scene may not be familiar with the well known or regionally adapted responses to the classic ballads, Larry often takes a moment to bring them up to speed, making the evening a truly interactive experience. He also brings with him a set of “The Viking Pirate Captain’s DL Songbooks,” with the lyrics to over 100 of the world’s favorite Irish pub songs for use by the audience. Larry is fluent on both banjo and guitar, switching between the two instruments frequently throughout the night, adding to the diversity of his style. He plays to his crowd, and as the night progresses Larry might incorporate other well known American classics in the spirit of Jimmy Buffet and Elvis Presley, but he otherwise keeps the set tight with Irish tunes. Larry Kernagis is originally from Chicago, but relocated to Nashville, Tennessee where he formed his band Def Leprechaun. His performances make for an evening of ruckus and revelry. Over the past few weeks, I’ve come to think of him not only as a great performer, but as a friend. Don’t miss Larry Kernagis, whether he is in Pensacola, Nashville, or Las Vegas. If you’re a little Irish or even just a fan, you’ll love Larry’s show. 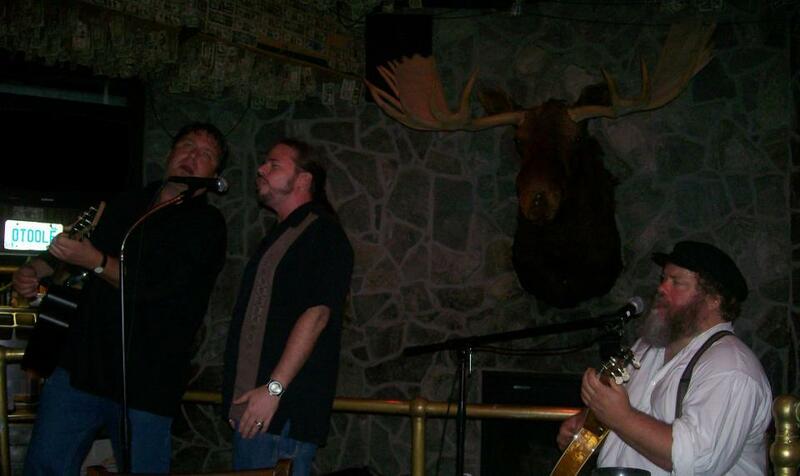 Check out Larry’s band Def Leprechaun at their website here!